Over the last few years Fractal Design has cultivated a reputation for delivering intelligent, quiet, and well-built PC cases that do not require breaking the bank. With solid steel construction, ample storage options, and three hydraulic bearing Silent Series R2 fans (2x 120mm, 1x 140mm) included, we should expect the ARC MINI R2 Micro-ATX case to continue this tradition. 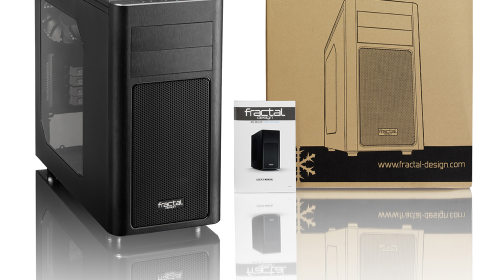 However it is natural to wonder if Fractal Design can deliver the innovative features of its larger, more expensive, chassis at the smaller enclosure’s $99 price point. Let’s find out. If I have received a mail-ordered PC chassis where the box was not damaged on arrival, the experience escapes my memory. Fortunately, although the packaging protecting the Fractal Design ARC MINI R2 was punctured with some force (it was double boxed, and neither cardboard is flimsy), the case was completely unscathed. After opening the box it was immediately apparent why the ARC MINI R2 survived – attention to air space and protective material. Unpacking was straightforward; though remember to eat your Wheaties or line up a spotter ahead of time. Like with the case itself, attention to detail was evident in the packaging. I especially appreciated that Fractal Design places the box with the screws and ties in a hard drive tray; little chance it will break open in transport and require fishing around for all the little bits inside. The ARC MINI R2 is black, and the light texture on the steel panels absorbs the light. The front and top panels are plastic, not steel like the rest of the chassis, but I do not mean that as a knock, just a clarification. When I first looked at photos of the case, they fooled me into thinking that they were aluminum and steel respectively. In person, subtle differences in light reflection announce a change in material, but it is still quite easy to be deceived by the faux grain and smooth finish of the surfaces. I even found myself tapping it unconsciously during this write-up to ensure that it was in fact, plastic. Obviously, to meet the $99 price point some compromise is required, but it is amazing what Fractal Design was able to do with these elements while keeping the recognition of that trade-off so well hidden. Structurally, there is no compromise. The flexibility, intelligent layout, and a clear attention to sound industrial design is evident everywhere. Clearly this enclosure was built by people who know how to assemble a PC; where you need space and where you are going to tinker later. Looking more closely at the case, the attention to detail is obvious. Exposed edges are rounded, holes intended for pulling cables plentiful and protected with rubber grommets, there are tie downs for securing the routed cables, the underside of the CPU is exposed making it easy to replace screw-down heatsink and fan (HSF) coolers without pulling the board, the center hard drive bay is removable for long GPUs, can be oriented to face the motherboard if desired, and every fan port has a filter that can be removed without tools for cleaning just to name a few. Having some experience with their previous generation chassis, it is clear that Fractal Design has taken feedback from earlier designs and made their excellent enclosures even better. Highlighting two of my favorite innovations: a thumb-tool for screwing in the motherboard stilts (yeah, you can put the pliers away! ), and the front panel USB 3.0 cable which also includes a USB 2.0 header if the motherboard doesn’t support USB 3.0. Unsurprisingly, the build was effortless. Only complicated by continuous tinkering as new features were discovered, or an alternative option for maximizing cable efficiency explored. In most chassis, there are only a couple/few ways to put the kit together “right”; but in the ARC MINI R2 they are myriad. The Intel DH87RL only has two available fan connectors so the third (top) chassis fan was left unplugged (note: the chassis includes a 12/7/5V fan controller so it could have been utilized, but not monitored) and Prime95 run with the hardware noted above for eight hours. To create a baseline ahead of the test, the system was used for two hours of light computing (noted at “0”) beforehand. 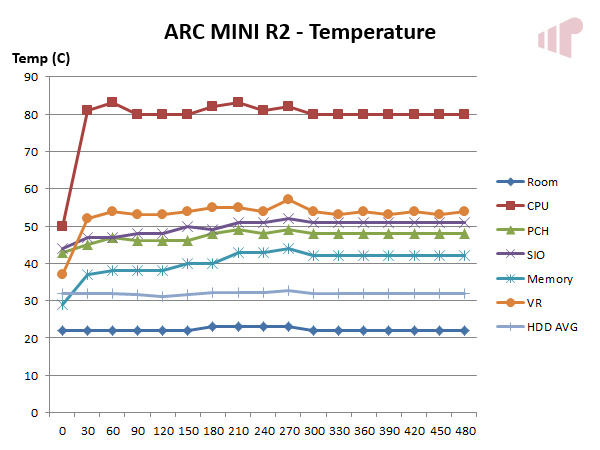 Aside from the expected initial rise in temperatures at the beginning of the test, the flatness of each curve indicates that the ARC MINI R2 performed excellently. Interestingly, we can see the point where the room temperature rose by 1.2 °C reflected in the internal measurements, and then the return to roughly the same values as the room cooled down again. Here we can see a similar trend in fan speed, which was managed by the system BIOS. What is not shown here is how quiet the system was during testing. 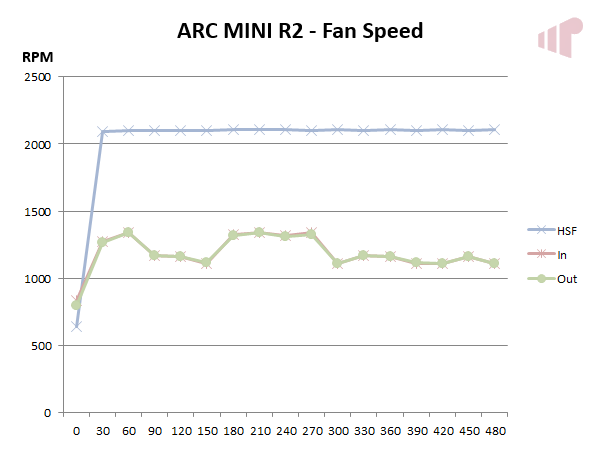 The case fans were inaudible, and the HSF only slightly noticeable when within a foot of the ARC MINI R2. Simply put, with the $99 ARC MINI R2 Fractal Design delivered yet another example of what we have come to expect from their chassis: excellent craftsmanship, value, and flexibility. With plenty of space for storage, expansion or water cooling if the quiet and efficient air cooling provided does not suite your needs the ARC MINI R2 will easily accommodate almost any Micro-ATX build. Whether building a file server, workstation or gaming PC this case can handle the requirements easily. The enclosure’s intelligent layout, removable fan screens, ample interior space, cable routing options and muted-handsome were all greatly appreciated. But unlike its larger “MIDI” sibling the ARC MINI R2 is not offered without the transparent smoked side panel. Which is, as far as I can tell, the only drawback, and that one of personal preference, to the ARC MINI R2. « SageTV: Past, Present, and Still Future?